Its very rare to have the 'Perfect' day, but thats what I did have yesterday, when I met up with my gorgeous blogger friends Wendy Brandes and Times of Glory, then onto the 'Perfect' evening with Wendys gorgeous husband Paul, taking us lucky ladies out for dinner!! The day started with myself and Wendy meeting outside her London hotel-we then decided to get a cab to check out the designer sale 'Mrs Sting' was having-a recommendation from Red Carpet Fashion Awards that eagle eye Wendy had spotted before meeting me!! To say there were designer bargains is an understatement-you name a designer, their clothes were there, at totally rock bottom prices, with all proceeds going to UNICEF-what could be better!! 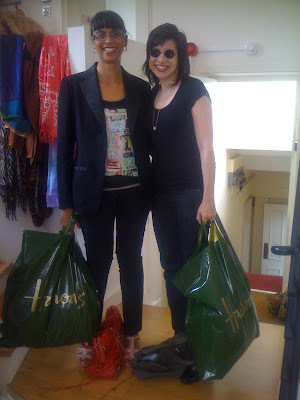 Myself and Wendy with our haul of designer goodies!! I bagged a Chanel jacket for £100(!!! ), a Roberto Cavalli top, a Pucci top, a Jean Paul Gaultier top, a Versace day dress and a Burberry blazer-all for a total of less than £200!!! Well Wendy and I were shopped out, so we staggered a few steps onwards to a lovely little pub, for a liquid lunch and flowing conversation! Times of Glory rang about 3.30, to check our whereabouts and of course wanted to check out the designer sale too!! Our 2nd visit and Wendy looks stunning in this McQueen jacket, which she didn't purchase, as she had already bagged a totally gorgeous white crochet Dolce and Gabbana summer coat, a Zac Posen exquisite evening gown, a Versace black top and a totally gorgeous buttersoft leather Christian Dior jacket!!! Well, onwards to Harvey Nichols, where Wendy bagged another superb bargain-some L'Wren Scott black sequin trousers that are totally and utterly divine!!! 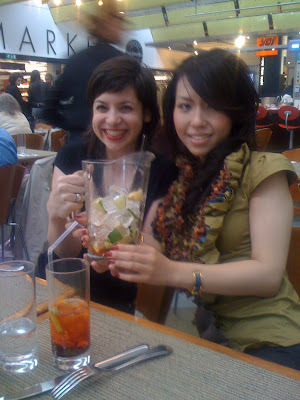 Another pitstop required, so we retired to the 5th floor at Harvey Nicks for a pitcher of Pimms-oh, how decadent of us!!! Time was marching on, so a cab took us back to Wendy's hotel, where her wonderful husband Paul was ready to take us for dinner-but not before I captured some shots of Wendy in her stunning new Ossie purchase!!! Wendy looking divine in her newest Ossie Clark purchase!! 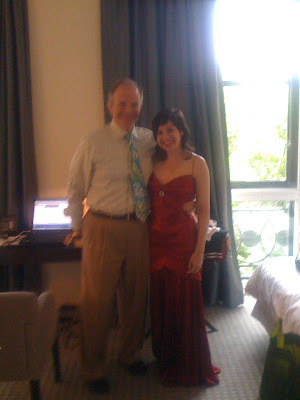 Wendy and Paul-Wendy looks fabulous in this Zac Posen gown-what a stunning find!! Dinner was exquisite-I had smoked salmon for starters, veal for main course and coffee brulee and espresso ice cream for dessert-oh what luxury and decadence to end the evening!!! A big, big thank you to Wendy and Paul for such a special evening and I've met a special friend in Wendy-our pub chat was a lovely way of getting to know each other more and also our mutual love of Ossie Clark ensured we had plenty to talk about! Times of Glory is another wonderful, sweet girl-another good friend and it was a pleasure to meet her-we all had a fantastic day-one I won't forget in a hurry!! I am so glad you guys picked up some great bargains. Hi there-I've just left a message for you too!! A great recommendation, thanks ever so much for sharing! I had the best time and I am hoping that we will have a fun Ossie event to attend in September! That espresso ice cream was good, wasn't it? I feel like I could have bought about ten more things from Trudie. Hi Wendy-I'm still basking in a warm glow of yesterday-That will be totally awesome about the Ossie event-I so enjoyed our chat in the pub yesterday about Al and Ossie!! The whole meal was exquisite (my new word, as you can see-haha) I'm just pinching myself that it wasn't a dream yesterday-it was a dream day come true!! Hi B-yes, to say the very least!! Hi fashion dreamer-Yes, I'll get some photos very soon of my bargains!! wooow, must have been a fabulous day! you three ladies look so beautiful, and what wonderful things you have bought! the perfect day does exist. Hi cate-thanks so much, yes I had a totally wonderful, exquisite day!! Hi b-thanks, one to do for next week!! WOW..how fun. Such beautiful outfits. Looked like a great time for everyone. Shopping pics are so fun! That McQueen jacket is a real stunner! looks like a fun time! lucky you! Looks like a wonderful day :). Sounds like a fun party. Looks like you picked up some sweet deals too! Please post photos of the purchases! It sounded like a brilliant day on top of the shopping. so glad someone found an ossie clarke! all other finds sound fantastic too, good for you ladies! oooh! I love the pictures! It's fun to see fashion bloggers have a grand time... can't wait to see your loot!! Hi ellie-yes we had such a fantastic time, thanks!! Hi pammish-yes a very decadent day-haha!! have a great weekend! Hi style du monde-It was so fabulous,thanks!! Have a good weekend too! 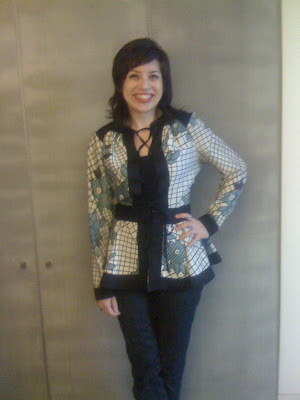 Hi couturecarrie-yes, this jacket was made for Wendy, but she had already got some major finds!! Hi p-thanks it was wonderful! Hi nadine-thanks, a great time was had!! Hi Times of Glory-we had a fantastic time, didn't we? It was a pleasure to meet you and like you say, we must do it again!! 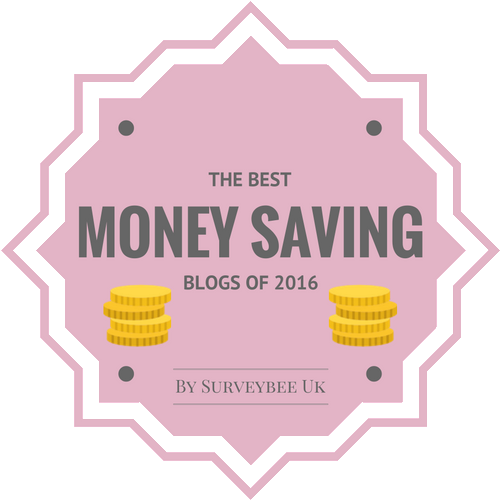 Lets save up first-haha!! Hi fashionpuppy-thanks-I had an ace time! Hi nay'chelle-Yes the bargains were too good to be true!! Hi wendy-I'll be posting my finds soon-thanks!! 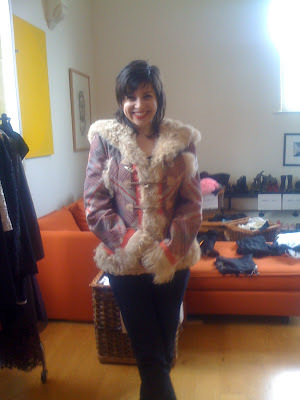 Hi karima-Wendys Ossie jacket is a dream find-so exquisite!! Hi the world is my catwalk-thanks so much, I will post my finds soon!! Wow what an amazing day! Hi winnie-it was, thanks so much!! Looks like you all had so much fun!! Hi yiqin-thanks so much, Wendy bagged some gorgeous things during her London stay!! Oh that looks like so much fun!! I wish I could've been there with you all! You all look as beautiful and stylish as ever! Wendy's purchases are awesome! Thanks for the compliment Sharon! I don't usually wear nail polish either but I thought it's summer, so why not? I hope you're well...take care and enjoy your day! it's so much fun reading all three accounts, this should be an annual meeting! Hi danz-thanks so much-it really was such a fabulous day!! Have a great week too! 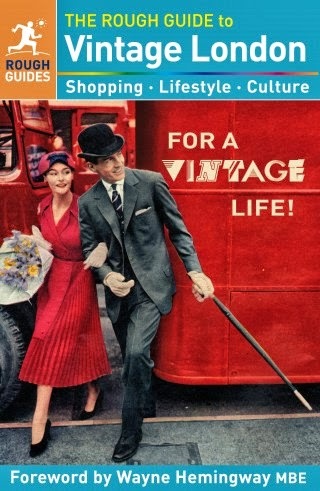 Hi fashion herald-haha, that would be fun!! So lovely to see you all together! Looks like it was agreat day with lots of fun. Love the zac posen gown on wendy, such an amazing dress. Very happy you all scored some great deals! Hi Silje-thanks so much, it really was a memorable day and great bargains were had as well!!! WONDERFUL! What a great post. Such fun for fashionistas to get together and look cute while shopping and dining in style. I loved every account of your wonderful day and fantabulous evening. I miss those days, since I don't have a car and have been pretty isolated lately, but I look forward to getting back in the swing of things soon and getting out more. Hi Cheryl Lynn-I think it was so perfect as I don't ever go out like this, so it was greatly appreciated! !